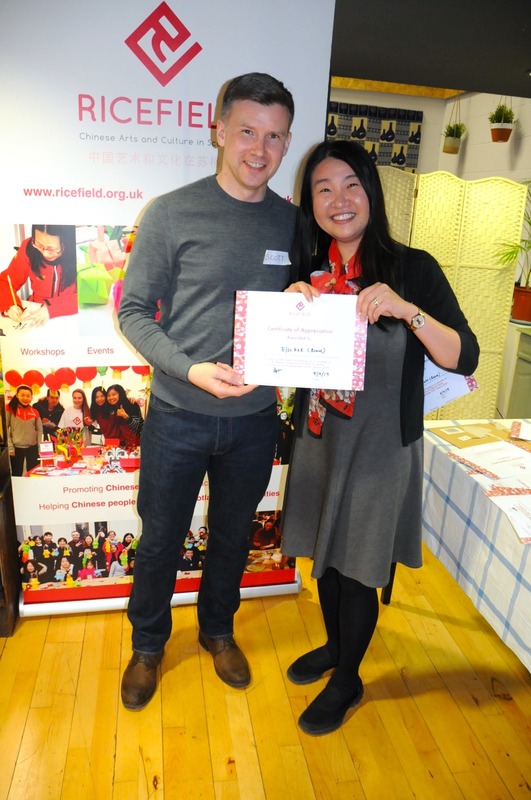 We were delighted to host our annual Volunteer Celebration on Friday 5 April. 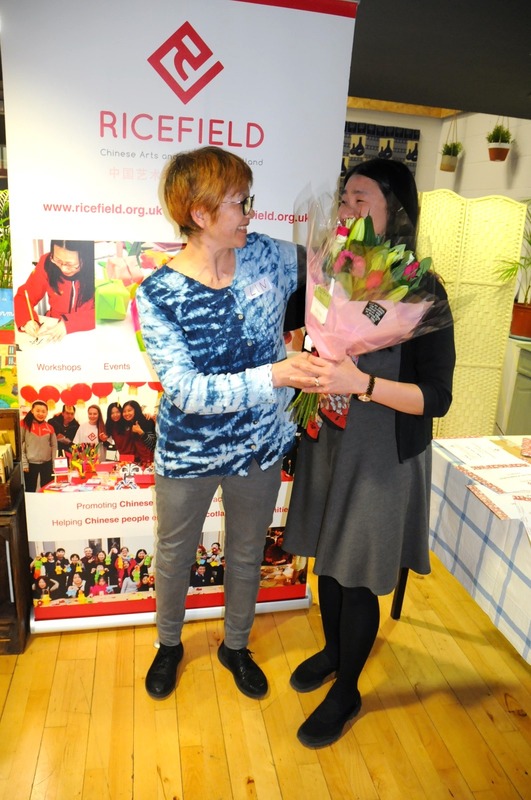 The evening celebrated the hard work, dedication and contributions of our lovely volunteer team who gave their time & energy to support our Christmas & Chinese New Year activities, as well as marketing and our growing Chinese Community Library. 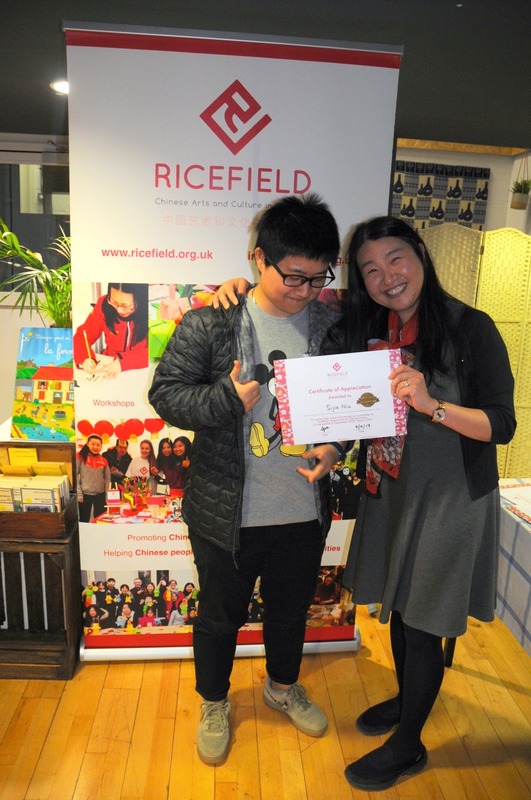 Ricefield’s year-round programme of events would not be possible without them! We shared a tasty meal in The Cafe Hub, before a round of human bingo and paper tower building. It was then time for the evening’s main event, our certification presentation and Outstanding Volunteer awards. Check out the award winners below! 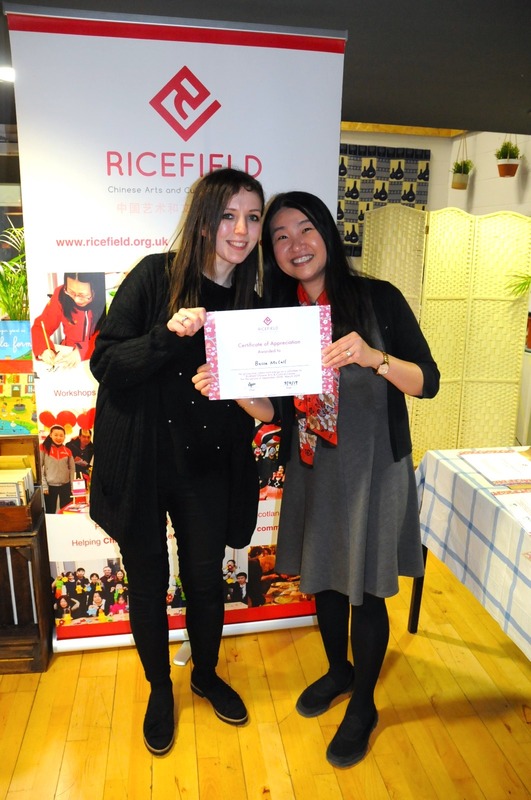 Ricefield Arts hosted our annual Chinese New Year celebrations on Sunday 17 February, this time visiting both Kelvin Hall and the Riverside Museum. 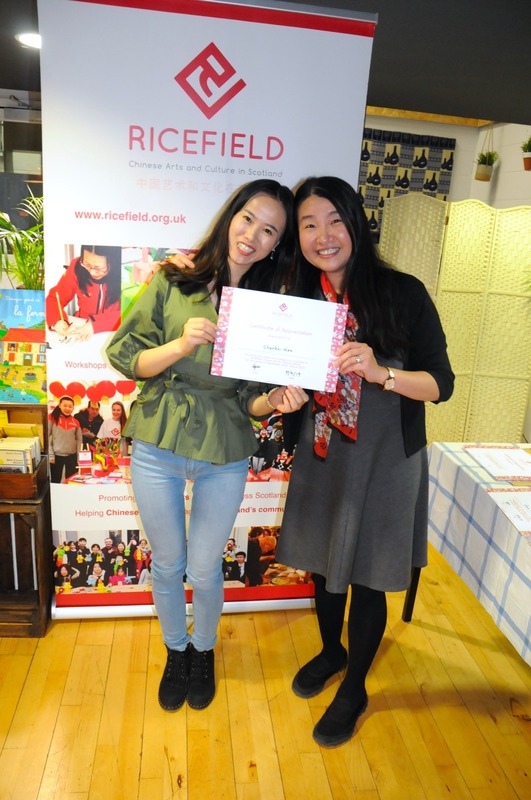 We were delighted by the crowds at both venues, and the opportunity to spread awareness of Chinese culture and traditions through crafts, games and sports. This busy programme of activity wouldn’t have been possible without the support of our hard-working volunteer team. Here, new volunteer Becca McCall shares her experience of the day, along with some great photos by Debbie. Gong Hei Fat Choy – Happy Chinese New Year, it’s the year of the pig. 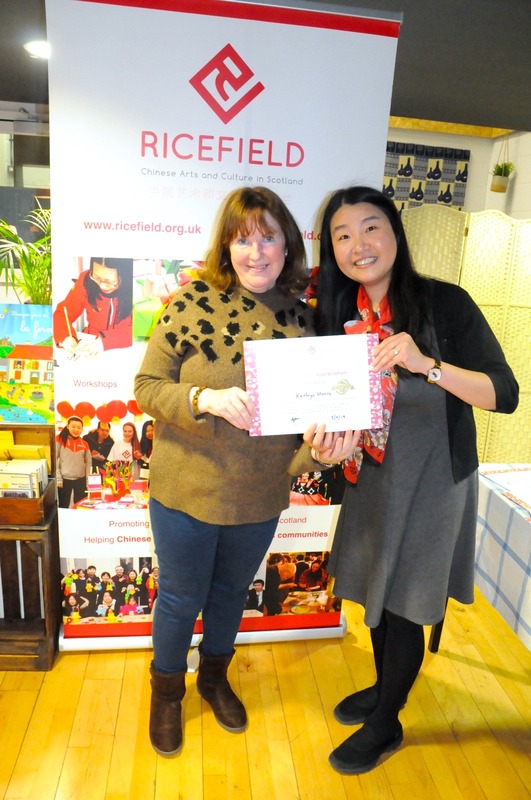 I had the wonderful experience of helping Ricefield Arts with their Chinese New Year Family Day at the Kelvin Hall on Sunday 17 February. This was my first time volunteering at one of their events and it won’t be the last. The aim of the event was to teach visitors about, and allow them to participate in, a range of popular activities and games. In order to do this effectively over 35 volunteers were recruited to help throughout the event. We all gathered in the Activity Room at 10am and were assigned to our groups, and I got the opportunity to help with the colouring competition stall with some amazing people. The activities chosen were suitable for the whole family and proved popular with the volunteers and the visitors. As members of the general public entered the reception area of the Kelvin Hall they were encouraged to write a wish on a piece of card which was then hung from a ‘wishing tree’ set up next to our Information Desk. This is a popular New Year tradition. We hope all the wishes come true, even the one with the unicorn. There was the shuttlecock game, which is known as jianzi and has been a popular sport in China for over 1000 years; the aim of the game is for players to keep the shuttlecock off the ground for as long as they can. All ages were more than happy to take part. We played this while setting up before the event, despite its difficulty it was very addictive to play, especially with the volunteers. We all had so much fun playing this game – I’ll definitely be investing in one of these shuttlecocks! There were plenty of other activities for everyone; there was calligraphy demonstrations, which of course proved to be such a popular stall with plenty of people crowding around the table wanting temporary tattoos of animals and their names in Chinese. I got a purple cat with my name next to it. There was the Chopstick Challenge, Cat’s Cradle, Catch the Seven Pieces, a photo corner with lots of detailed costumes and fun props for adults and children to play with, a green corner hosted by Ricefield’s When Red, Go Green project to encourage visitors to upcycle, Chinese Zodiac, a colouring competition, stamp making and some table tennis at the back. This was the busiest this event has ever been so far – over 900 people attended this year, a lot more than last time, which was 600. Perhaps next year it will reach over 1000! 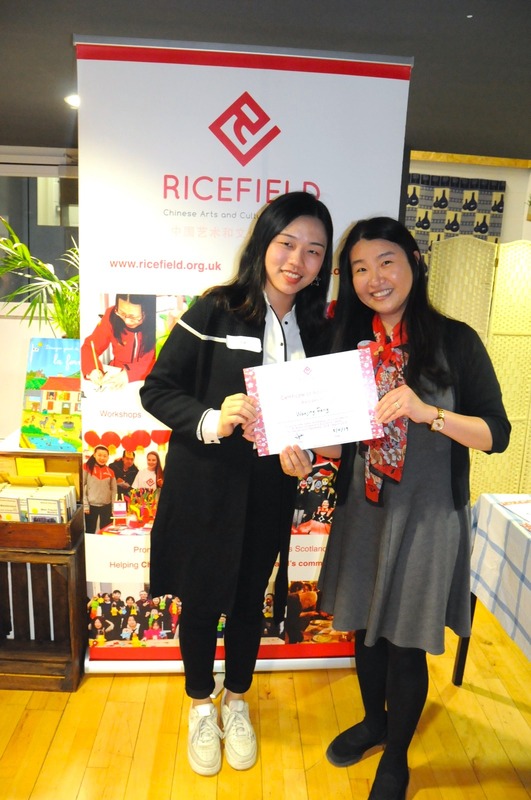 Throughout this event I got to meet extraordinary people with lots of skills and talents, some have been volunteering with Ricefield for a while and others were newcomers like me. There was a lot of positivity surrounding the event, and I, among many other volunteers, new and old, are looking forward to the next. See you soon. Thanks Becca! Check out more photos on our Facebook page. We were delighted to return to Kelvin Hall and the Riverside Museum on Sunday 17 February 2019 to host our annual Chinese New Year Family Day celebrations. 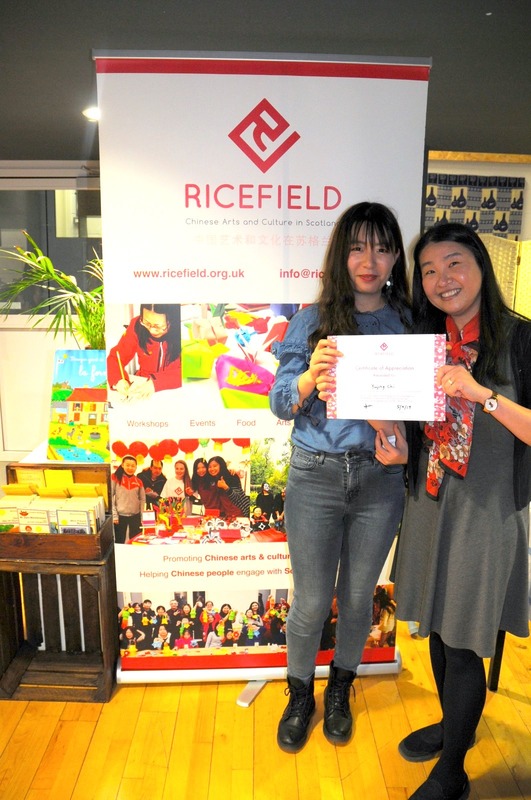 Our busy activity programme ranged from Chinese hanfu clothing and calligraphy, to games, sports and crafts – alongside a very special colouring competition! Our team of Ricefield artists reviewed all the colourful entries, and we are now happy to announce our lucky winners. A big congratulations to all three of them – each will receive a Chinese gift set with sweets, treats and crafts. This January we’re taking a moment to reflect on the past year – our growing team, our successes and our increasing development. 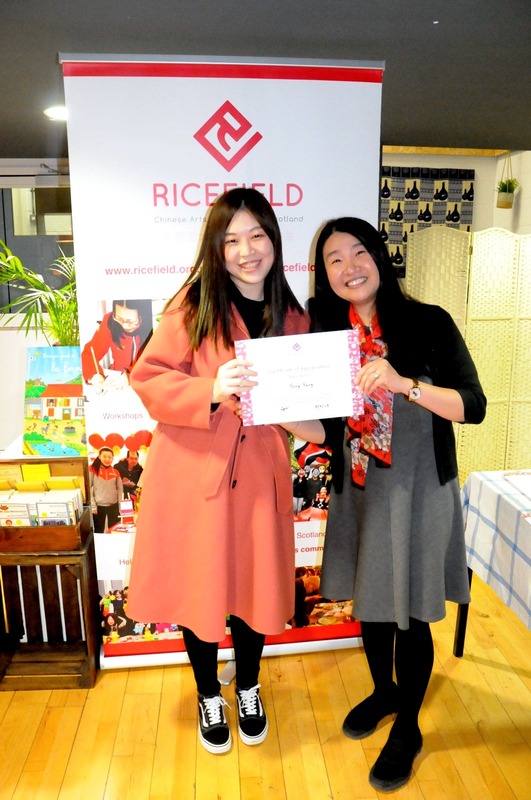 2018 was a busy year for Ricefield Arts! Here’s a round-up of some of our highlights. We were delighted to receive funding from Our Place Fund to deliver the inaugural Glasgow Kite Festival in Bellahouston Park on 22 July 2018. Part of the European Championships Festival 2018, the event highlighted the long history of kites – invented in China over 2000 years ago. Visitors were able to make their own kite using bamboo and following traditional methods. 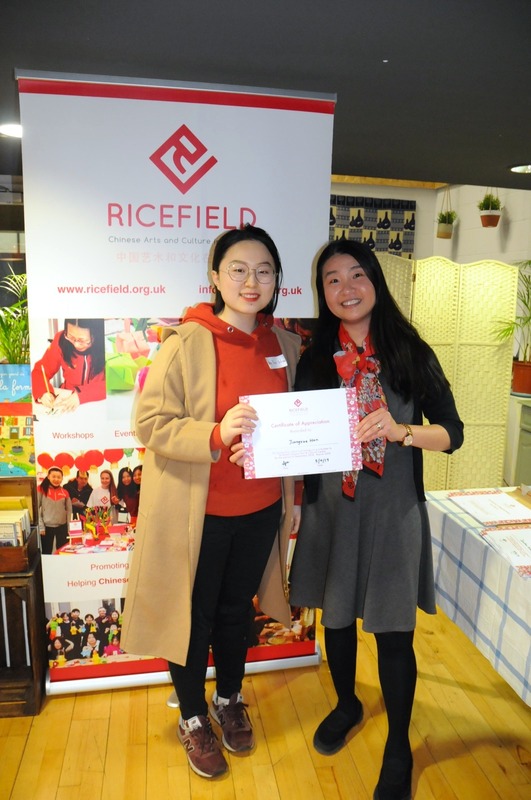 There were also free craft workshops, the chance to try traditional Chinese clothing, a treasure hunt and an exhibition – and of course, kite flying with demonstrations by the Kite Club of Scotland! 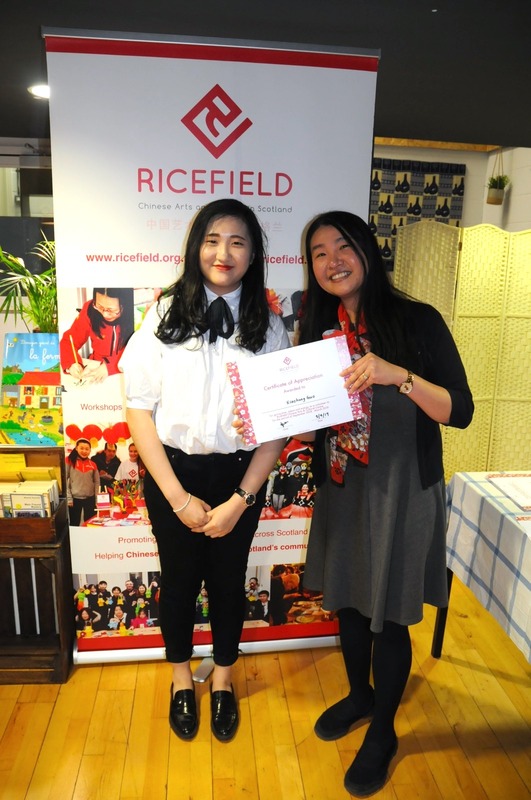 We were also happy to visit local areas in Glasgow during July for a series of community kite making workshops with Gilded Lily, Interfaith Glasgow, Chinese Community Development Partnership, Glasgow Mela and Kelvin Hall. A big thanks to our team of over 30 volunteers who made the festival possible, as well as to our additional partners Glasgow Life and Glasgow Sport. 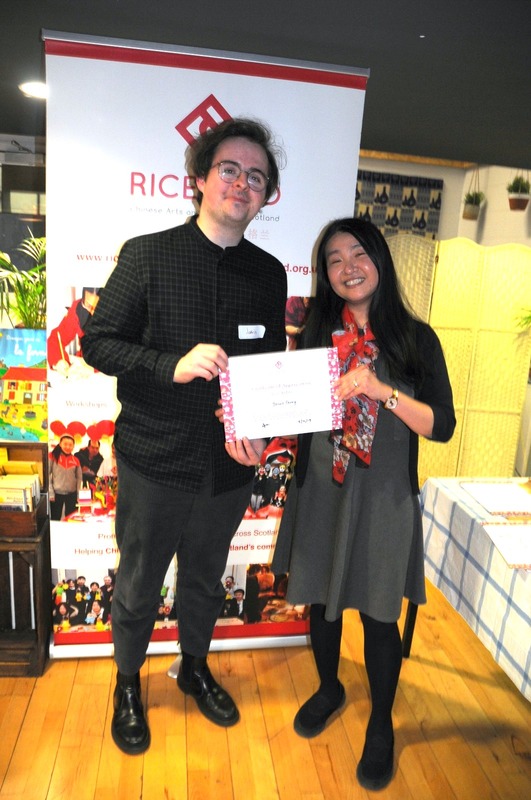 Being awarded funding from the Scottish Government’s Climate Challenge Fund for our two-year climate change project When Red, Go Green was a significant step for Ricefield Arts in 2018. The project aims to increase climate change awareness and encourage sustainable living in our Glasgow community, and is compromised of three main sub-projects: Grow & Cook, Pace & Pedal, and Reuse & Reduce. 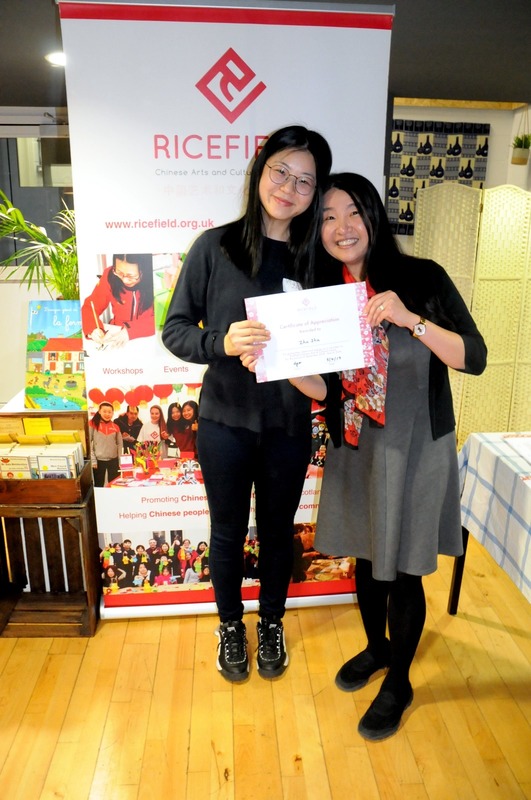 The funding supported four new staff members: Lindsey, Clarinda, Rita and Kam Fung, and a busy programme of activity including free cookery, cycling and mending workshops, climate change conversations, swap shops and the development of our Chinese Community Library (more on that below!). The team have since launched a brand new project website and Twitter, which is full of information and hints & tips for reducing your carbon footprint. We launched our Chinese Community Library in October 2018, a sub-project of our When Red, Go Green activity. Based in Baltic Chambers, the library aims to be a cultural hub, as well as encouraging a circular economy through the sharing of resources. Since then the Library has been the venue for many of our events and workshops, and is additionally available for hire. The book collection it houses has been developed entirely through donations, and covers a wide range of topics including Chinese art, language, history, philosophy and medicine. It is open for book borrowing and research each Wednesday. If you’re interested to join for a free as a member, head to the When Red Go Green website. We were absolutely delighted to be awarded the CEMVO Ethnic Minority Impact in Arts and Entertainment Award for the second year running at their ceremony in November 2018. MSP Humza Yousaf presented us with the award, following a thoughtful nomination by Jade Graham of Glasgow Life. The team had a great evening, inspired by the hard work of the other nominees and award winners. We were delighted to celebrate the Year of the Dog in February 2018, with activity throughout Scotland. In Kelvin Hall, we hosted our second year of celebrations with a games & sports theme. Following our Zodiac Animal Activity Trail, visitors tested their chopsticks skills, learned Chinese calligraphy, tried Chinese chequers, Tangram and the Game of Go, made Year of the Dog crafts, tried traditional clothing and played with shuttlecocks. There was also a very lively Lion Dance by our friends at Hung-Ga, as well as a chance to compare Scottish and Chinese New Year traditions and learn about stamps from the Scottish Philatelic Society. We also visited Perth Light Nights for their weekend of Chinese New Year celebrations, hosting Chinese craft workshops on the river side and taking part in the colourful New Year procession. We continued work with a broad range of partners in 2018, aiming to reach new audiences throughout the city. 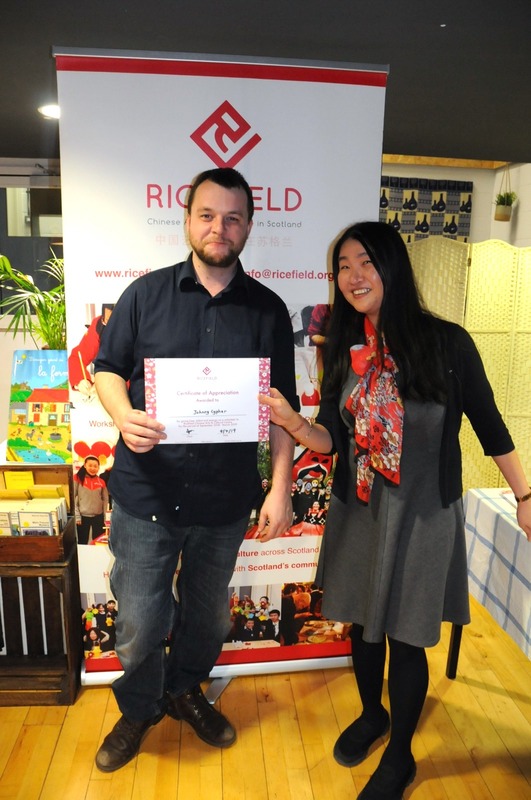 A highlight was our year-long project with Wing Hong Chinese Elderly Centre, supported by VAF funding. We’ve delivered craft workshops including felting, card making and collaging – all with the aim of increasing wellbeing and decreasing isolation within Glasgow’s elderly Chinese community. We were also delighted to take part in festival celebrations within the Centre, including a lively Mid-Autumn Festival event and creating a boat for Dragon Boat Festival. This year we also developed a new relationship with Britannia Panopticon, the world’s oldest surviving music hall in Glasgow’s Trongate. As part of their Halloween celebrations, Ricefield volunteers took part in two performances of the famous Chinese ghost story by Pu Songling: The Painted Skin. Ghost Stories from Around the World also featured tales from Russia and some more local characters from Glasgow’s gruesome history. 2018 also saw the culmination of the My Time project, led by Voluntary Arts Scotland. We hosted poet Larry Butler, who immersed himself in our work and community. He then produced a creative poem, Poaceae & Chameleon, inspired by how volunteers and board members described Ricefield. The finished poem now has a home on our website, and has been read by Larry at the Scottish Poetry Library – it will feature in an exhibition travelling to Glasgow this year! We love getting out in the summer weather, so we were very happy to take part in two of our favourite festivals in 2018: Glasgow Mela and Glasgow Canal Festival! At Glasgow Mela in June we held the first of our Community Kite-Making workshops, as well as other craft activities and a pop-up Chinese Craft Fair. At Spiers Wharf in August we led origami boat making, a second Chinese Craft Fair and a guided cycle-tour of the canal route. We also took part in events hosted by our friends at Kelvin Hall, pondered Chinese vocabulary as part of Book Week Scotland, celebrated the Hidden Gardens at their summer party, made Chinese-inspired headdresses at Leap Sport‘s Pride House and led family craft workshops at Kelvingrove Bandstand – to mention a few highlights! Our team of workshop artists grew this year, as we made new connections through our When Red, Go Green project and sought to further develop our support of artists of Chinese descent. Artists visited schools and universities, travelling as far afield as Middlesborough to share Chinese cultural traditions. 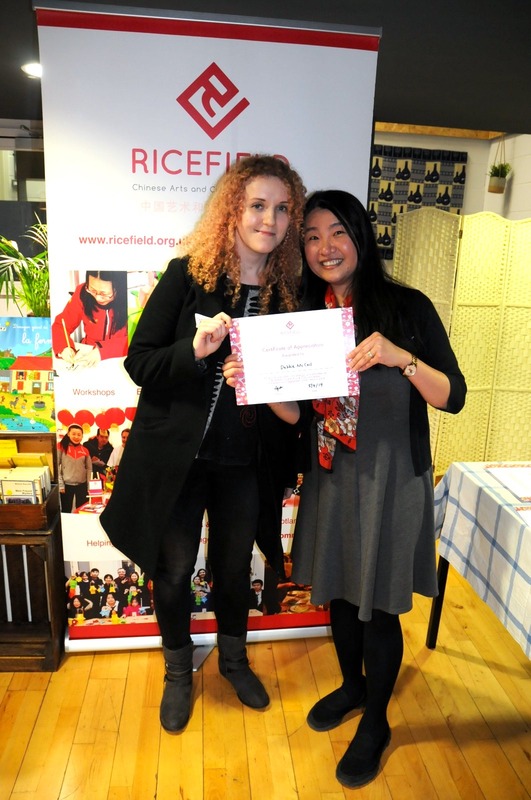 Our wellbeing project with Wing Hong Chinese Elderly Centre provided an opportunity for cross-generational dialogue, while funding from Book Week Scotland allowed artist Clarinda to develop a new workshop exploring the formation of Chinese characters and vocabulary. We’re looking forward to working with this team to further investigate both traditional and contemporary Chinese culture in 2019. We expanded our incredible volunteer team this year, with new library and marketing roles through our When Red, Go Green project. Volunteers also had the opportunity to take part in the event planning and delivery of Glasgow Kite Festival, as well as being responsible for photography and some very entertaining blog posts. 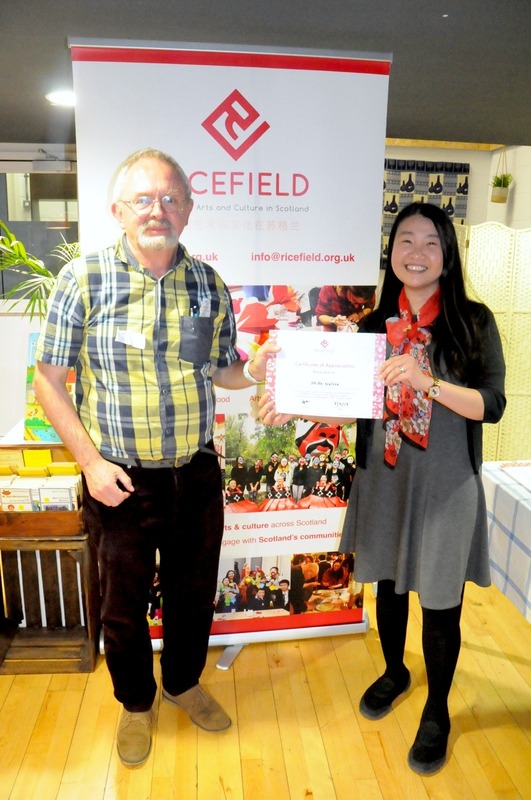 We celebrated the varied contributions of the team at our annual Volunteer Party, held in September at Project Cafe, with tasty food, games and awards. Interested in volunteering? Sign up for updates here. We’d like to take a final opportunity to thank everyone who made all this possible – including our dedicated board, our amazing team of volunteers, our hardworking staff, our funders and our partners across Scotland. Most importantly, we’d like to thank our diverse community of supporters. 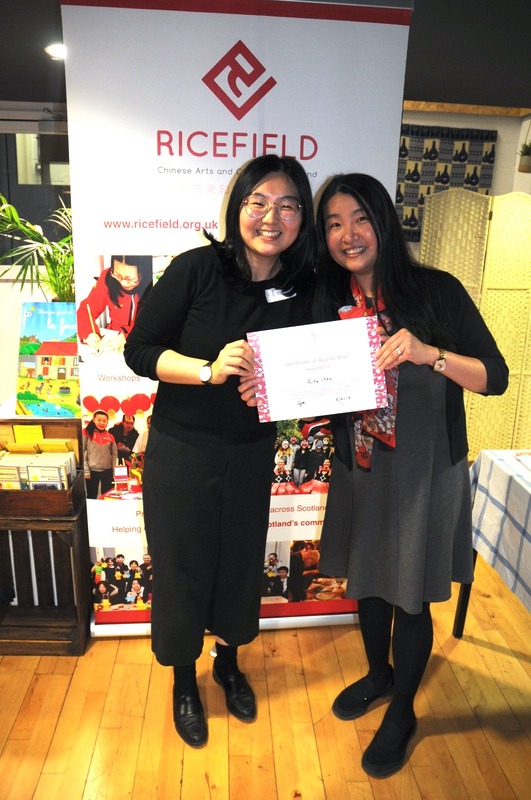 If you’ve attended a Ricefield Arts event this year, visited our community library, joined an art workshop, purchased crafts our at one of our stalls or engaged with us online – you’re helping us move one step closer to our aim of promoting the full spectrum of Chinese culture in Scotland. 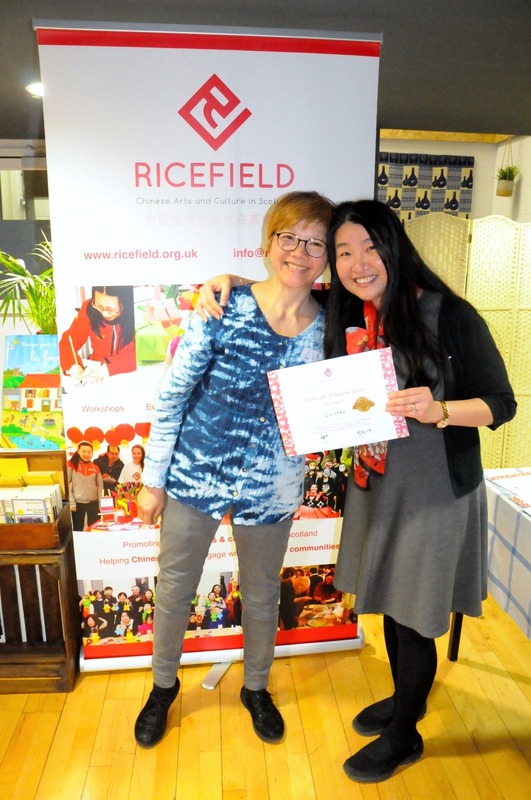 We’d love to hear from you about your favourite memories with Ricefield in 2018, or if you’re interested in working together in the future. Lots of 2019 news and announcements coming very soon! 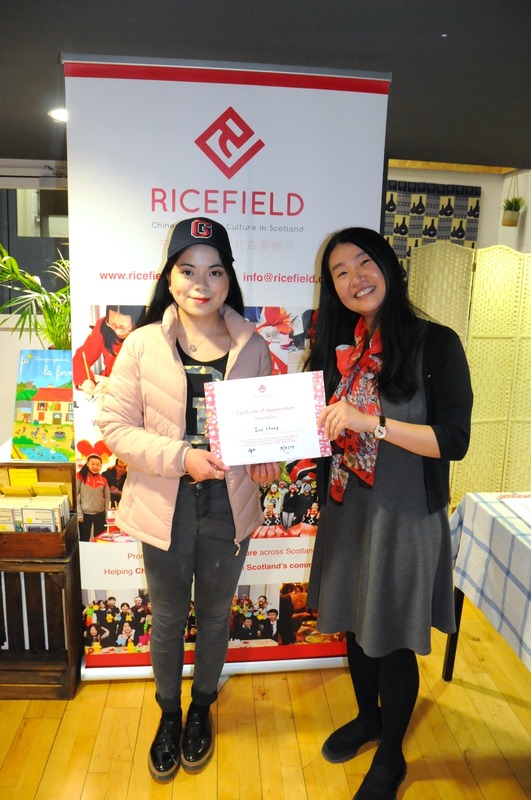 Ricefield was delighted to open our new Chinese Community Library in October 2018. Housed in Baltic Chambers, we hold a diverse collection of Chinese and English language books related to Chinese culture, art, history, philosophy, medicine and much more. The library is part of our When Red, Go Green project, funded by Climate Challenge Fund. The library offers a space for community workshops and events, as well as promoting a circular economy through the sharing and reusing of resources. The library room is open weekly on Wednesdays, 12-7pm. It is also the venue for a range of Chinese culture and climate change events and workshops. The room is also available throughout the year for hire. Located in the city centre, close to transport links and offering competitive rates, it is the ideal locations for meetings, workshops and small events. Find out more here. You can join for a free as a member at the library or via the When Red, Go Green website. To find out more about the project and the collection visit their dedicated website. We are seeking donations to expand our collection. If you are interested, please contact our When Red, Go Green team to arrange delivery. 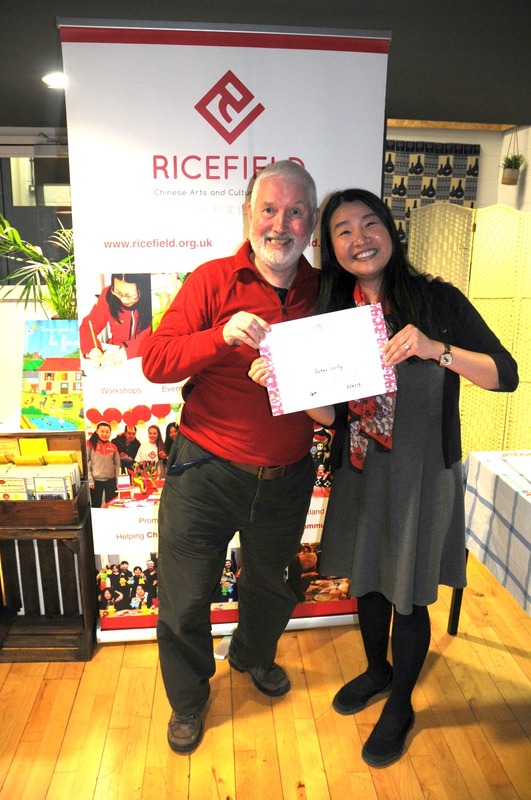 Ricefield Art’s When Red, Go Green project aims to increase climate change awareness and encourage sustainable living in our Glasgow community. We will achieve this through our 3 main sub-projects: Grow & Cook, Pace & Pedal and Reuse & Reduce. 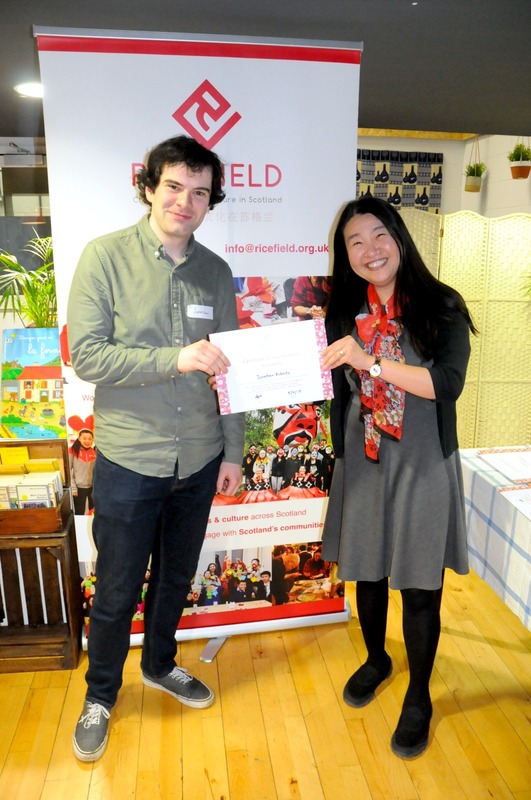 The activities programme for the next two years is varied, including the development of our own Chinese book library and community garden, free cycling, sewing and growing workshops, swap shops and climate change conversations. Interested in reducing your carbon footprint? Visit the site for more about upcoming events, as well as hints and tips on our forum. Ricefield Arts was delighted to host Glasgow Kite Festival on Sunday 22 July at Bellahouston Park. Visitors arrived to a sky filled with kites, and were given the chance to build their own following traditional Chinese methods. The Kite Festival was supported by Festival 2018, the cultural programme for the Glasgow 2018 European Championships. 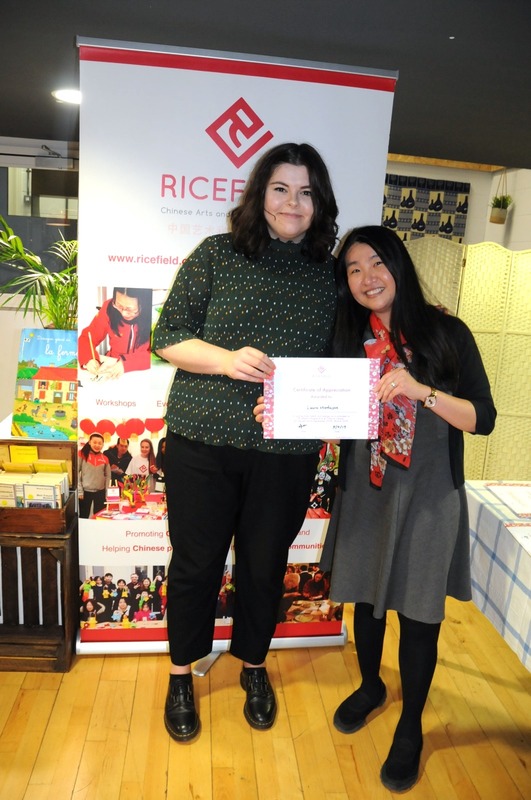 This summer I had the amazing opportunity to join Ricefield Arts & Cultural Centre, which is a social enterprise that is known for delivering original and inspiring Chinese cultural experiences across Scotland. I was part of the Glasgow Kite Festival that took place on 22 July 2018 at Bellahouston Park in the southside of Glasgow. The event aimed to not only share interesting facts about kites and their origin but also to promote creative activities such as how to make your own kite, treasure hunting, trying on traditional Chinese clothing, face painting and making bathbombs. Kites (风筝, fēngzheng) were first introduced in China over 2000 years ago, where they were mainly used for sailing communication, making signals and testing the wind strength. China had the ideal materials for kite making that include silk fabric for sailing and a resilient bamboo for a strong lightweight framework. The very first Chinese kites were actually flat and shaped like a rectangle. For most of the event, I was on the information point, where I was receiving feedback and providing any relevant information about the festival. As a newcomer, I was amazed by the huge amount of families who left overwhelmingly positive messages on our feedback kite tree. Many children took the time to draw their own small kites and hang them on our decorative tree, while others were seeking clues for the treasure hunt; the goal of which was to encourage people to look for hidden kites in the area and answer seven questions for the prize of a fortune cookie. People also had the opportunity to make their own kites from bamboo, which was the most popular activity of all and left many waiting. Fortunately, there was an alternative where they could hire kites of various sizes or try their luck at the lucky draw to win a kite, a customised kite festival badge, temporary tattoo, the popular Chinese fans, picnic blankets or the grand prize of Mugstock Festival weekend tickets. Many people took the time to try on the traditional Chinese hanfu clothing and take one of our self-crafted frames for a memorable photo, while small children got their face painted by Stardust Designs. Mid-festival Bonnie the Seal, the mascot of the Glasgow 2018 European Championships, joined us. Many children were very excited to meet Bonnie and got the opportunity to take pictures (or as Bonnie calls them ‘sealfies’). Glasgow Kite Festival was a perfectly windy summer day for kite-flying and I am very excited for the next upcoming events in August: one of them being the Big Summer Get Together at the Hidden Gardens on the 11th and Glasgow Canal Festival on the 25th. If what you just read sounds like fun, you could join me and the rest of the volunteers by signing up today. 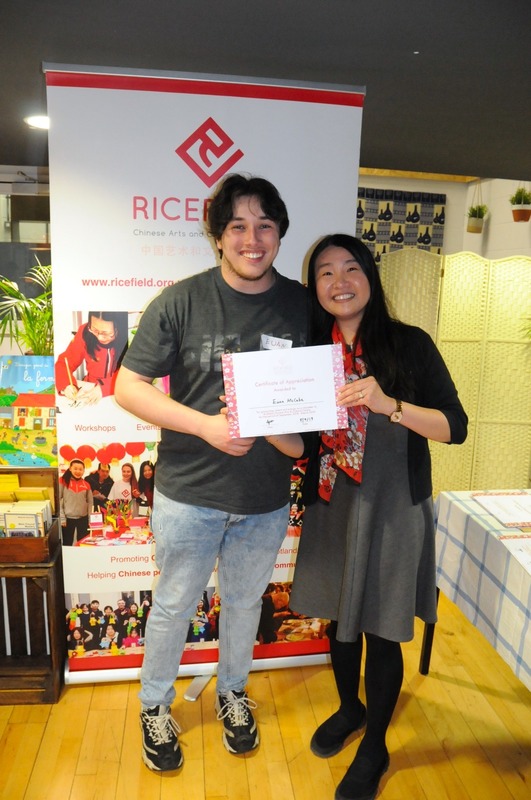 Finally, have a look at some great moments captured on camera by Ricefield volunteers Kevin Schneider and Wenjie Lai. 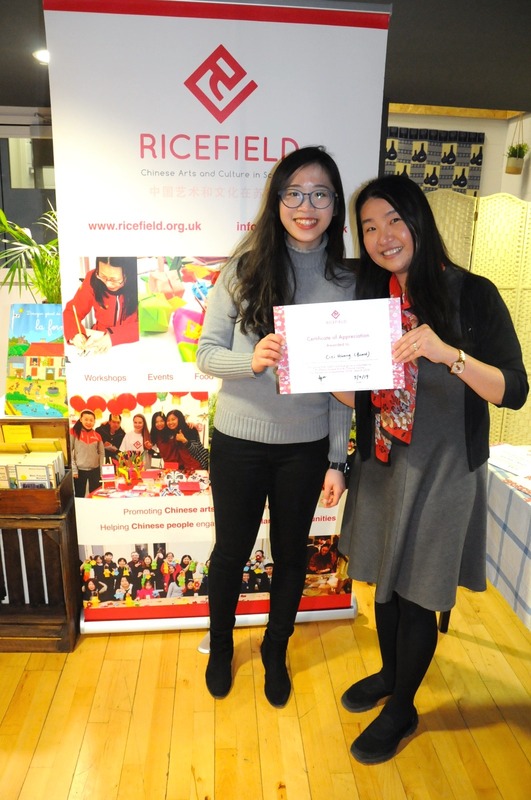 Thanks to our partners Glasgow Sport, Glasgow Life, The Kite Club of Scotland, and our local partners Gilded Lily, Chinese Community Development Partnership and Interfaith Glasgow. 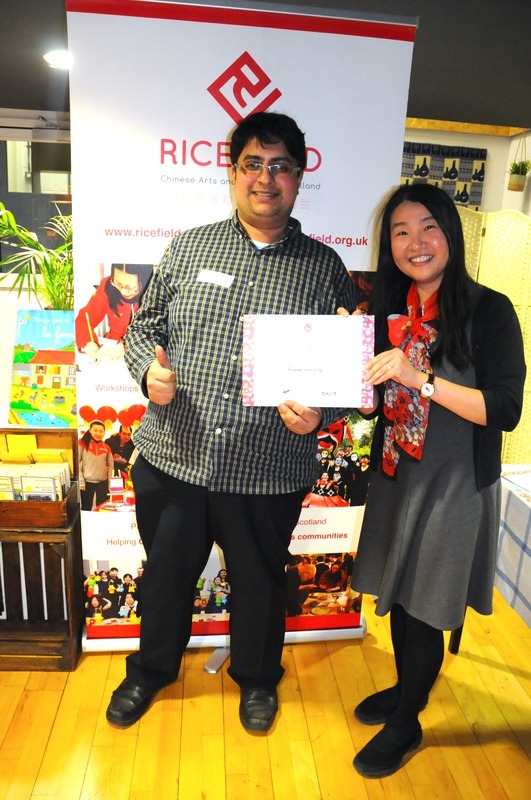 It has been a few years since Ricefield started its presence at Mela, the biggest free multicultural festival in Scotland. I joined this massive event for the first time and was quite stunned by the diversity of cultures, colours, music, and clothing gathered at Kelvingrove Park in Glasgow. The smell of Indian, Pakistani, and various other kinds of food was a blessing for the 45,000 people record crowd, but a curse for us volunteers craving for the plethora of cuisines. 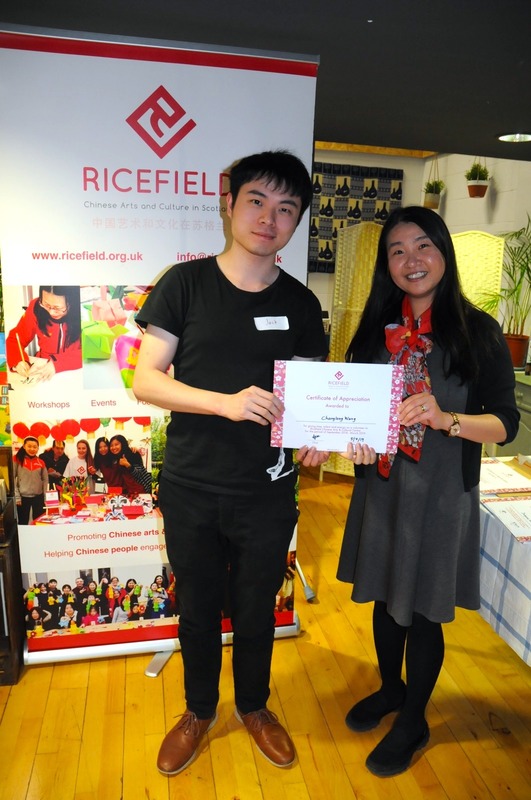 The growing Chinese community in Glasgow was reflected by a great turnout of Ricefield volunteers, and together we tried to make visible what is often hidden from the public: our Chinese community’s cultural heritage. A big part of this heritage exists as memories of childhood: making lanterns out of paper; building and flying your own kite; learning how to write Chinese characters. 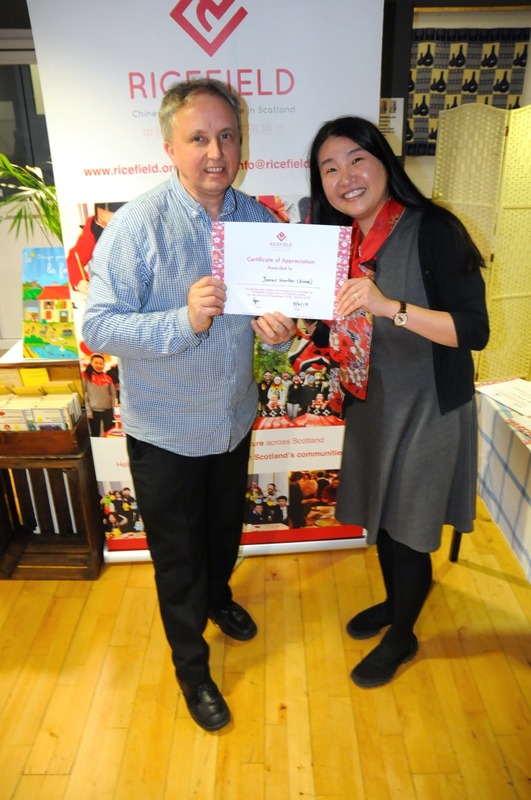 With these and other activities we tried to bring closer some of this Chinese heritage to the Scottish public. This was accompanied by several dance performances in Chinese tradition on the main stage of the festival and around Ricefield’s workshop space and stalls. Lanterns (灯笼, dēnglóng) have had a central role in Chinese culture since the Han Dynasty. At least one hundred and fifty years BC, Chinese Buddhist monks started using the mostly, but not exclusively, red lanterns as miniature versions of ceremonial bonfires. Since those times, the Chinese lantern has been engraved in the Western view of China and still forms a major element of decoration and ceremony in the Chinese heartlands and beyond. Similar but even more colourful lanterns were decorating Ricefield’s spaces at this year’s Mela, and, with the help of their parents and our volunteers, children produced sticker-covered paper lanterns in large numbers that could be seen hanging from trees all around. The main stage at Mela featured dozens of dance and music groups, from the various groups performing the traditional Punjabi dance Bhangra to the joyful Rajasthan Heritage Brass Band, but this year the visitors also had the chance to see Chinese dance performances. The Lantern Dance by children of the Glasgow Oriental Dancing Association (GODA) was for sure one of the visitors’ favourites. Their flawless performance was enhanced by the fact that they were just adorable. An absolute novelty was a passionate cross-cultural performance by Chinese, Flamenco, and Kathak dancers, supported by Ricefield. What surprised me was how easily one could find similarities among those three dancing styles from three distinct cultures, such as the movement of hands or facial expressions. Offstage, two lion dance (舞狮, wǔshī) performances by the martial arts group Yee’s Hung-Ga attracted the crowds to Ricefield’s premises, where they were met with cabbage spitting by our beloved, very acrobatic lion. This year, some of our volunteers also showed off their Chinese dancing skills, in traditional Chinese attire, to the visitors’ delight. Have you ever wondered what your name looks like in Chinese characters? Based on a name’s pronunciation, similar-sounding characters can be used to assemble a Chinese version of non-Chinese names. As it is hard for us Westerners to remember those complicated Chinese characters, our volunteers helped the visitors by using their calligraphy (书法, shūfǎ) skills to “engrave” Chinese tattoos on their hands. Protected by a tent from the unusually strong Glasgow sun, guests were then invited to make their own paper dragons, which led to some splendid results. Dragons (龙, lóng) have been an integral part of Chinese tradition for at least 7000 years now, and were a popular symbol of power during the imperial days. With a tradition even longer than that of lanterns, kites (风筝, fēngzheng) were invented in China at least as early as the 5th century BC, in the early Warring States period (战国时代, zhànguó shídài). Originally the kites’ sails were made out of silk instead of paper, which, together with a bamboo framework, made for a lightweight design. The first record of paper kites dates back to 549 AD, but they may have already been used earlier than that, since paper had been invented about 700 years before that. While historically they had been used for communication, signalling, and testing the wind, kites soon gained importance as a form of entertainment, which lasts until today. The skill of building kites was taught at the Mela Festival by our volunteers most skilled in handicraft, and the children were immediately filled with joy when seeing their own kites up in the air. Chinese kites, paper cuts, calligraphy tools, and many other items connected with Chinese culture could be purchased at our merchandise stall. There, fortune favoured the bold visitor who bought our red pockets or Chinese fortune cookies. Both fun and delicious prizes awaited the winners. Mela 2018 was a sunny summer treat for thousands, and I am already looking forward to our next big event, the first ever Glasgow Kite Festival on 22nd July! Come along and volunteer, or just fly a kite with us! Thanks Kevin! Find out more about Glasgow Mela on the festival’s website. Special thanks to Yee’s Hung Ga Edinburgh for another spectacular Lion Dance. Let’s fill the Glasgow sky with kites! Come along to Glasgow Kite Festival on July 22 in Bellahouston Park for a day of fun activities for all ages. You’ll have the chance to make, decorate and fly your own kite, as well as learn about the kite’s long history from ancient China to today. There will be craft workshops, games and sports, a chance to try traditional Chinese clothing, a treasure hunt with a special prize, and, of course, kite flying. The festival is free, and open to all – you don’t need your own kite to join in! Find us in Bellahouston Park, beside Mosspark Boulevard. Join our Facebook Event for the latest updates. Supported by Festival 2018, the cultural programme for the Glasgow 2018 European Championships.